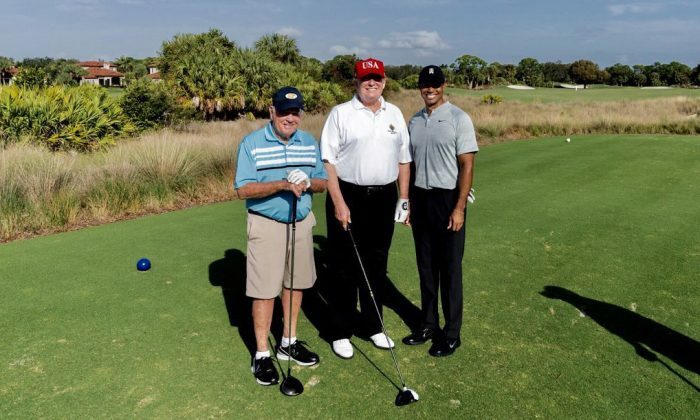 President Donald Trump has hit the golf course with legendary golfers Tiger Woods and Jack Nicklaus at Trump National Golf Club in Jupiter, Florida, according to a tweet the president posted on Feb. 2. “Great morning at Trump National Golf Club in Jupiter, Florida with @JackNicklaus and @TigerWoods!” Trump tweeted along with a photo of himself with the two legendary golfers. The post was made a day after Trump arrived in Florida, escaping the cold and snow in Washington. This is Trump’s first trip to Florida since Thanksgiving. He was supposed to spend time there during Christmas but chose to cancel his plans and remain in Washington due to the 35-day partial government shutdown. The shutdown ended on Jan. 25 after the president signed a short-term spending bill. Several photos and videos showing the president and Woods playing golf were also posted to social media. Both Nicklaus and Woods are among Trump’s regular golf partners. Nicklaus also designed the Jupiter club’s 18-hole course, according to club’s website. Woods has had a recent win at the 2018 Tour Championships. Meanwhile, Nicklaus won 70 official events on the PGA TOUR between 1962 and 1986, and was the oldest winner in Masters Tournament history at age 46, according to World Golf Hall of Fame. The pairing on Feb. 2 was believed to be the first time Nicklaus and Woods have played together since 2002 at a Monday night exhibition called “Battle at Bighorn” in California. Nicklaus and Woods were teammates in a match against Lee Trevino and Sergio Garcia.